Gathering the data took years of preparation and a bit of luck, but combining that information necessitated the creation of completely new technology. Enter Katie Bouman, who as a graduate student in computer science at the Massachusetts Institute of Technology three years ago led a team of researchers to create an algorithm robust enough to compile the EHT data. Not previously involved in the fields of astronomy or astrophysics, Bouman was recruited to the program while working on a PhD in computer vision. "We all watched as the images appeared on our computer. The ring came so easily. It was unbelievable," Bouman said in a statement to Time. "Even though we had worked on this for years, I don't think any of us expected we would get a ring that easily. We just expected a blob." Using a MacBook Pro, likely as a remote terminal, Bouman was among the first people in history to cast eyes on a black hole. The photo of her initial reaction was taken last year, but was kept secret until today's announcement. Bouman will soon start work at Caltech as an assistant professor, though she intends to continue with the EHT as the project moves toward the collection of more advanced imagery like movies. 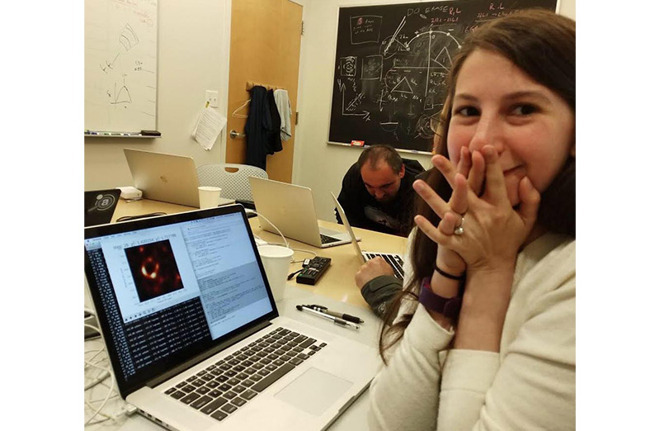 Bouman's algorithm is also being used to process a data from a second black hole target, Sagittarius A*, which could yield results in the near future.